Gary Burks has won the RunGood Poker Series Main Event for a massive score of $41,519. RunGood's second trip to Bossier City was another roaring success, awarding over $254,700 in cash and prizes during the six-day series. 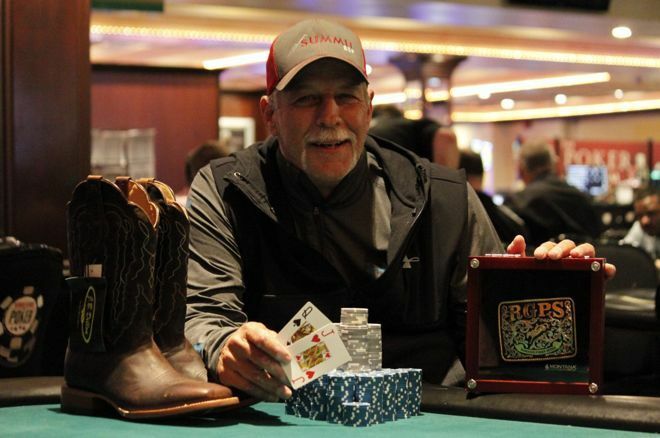 The weekend wrapped up with Gary Burks (lead photo) taking down the Main Event and $41,519. The Gladewater, Texas, resident conquered a tough field of 378 entrants to take home the first place prize, a pair of boots from Boot Factory Outlet, and a custom belt buckle from Montana Silversmiths. Burks made Day 2 of the $180 Deepstack event on Wednesday but went out short of the money. For the $575 Main Event, Burks was determined to improve on his results. He came into Day 2 in the middle of the pack with 102,000 chips but weathered the good and the bad to arrive at the final table with a below-average stack of 555,000. When heads-up play began, his opponent Pej Preemo held 5,400,000 chips to Burks’s 2,160,000. Burks went on a heater, turning a bigger boat than Preemo’s, and a few hands later flopping a boat and trapping his opponent into another all-in confrontation for nearly back-to-back double-ups. "I might buy a new tractor for the farm or a new bow. Bow season is about to start." When the last hand of the night began, Burks held 5,370,000 to Preemo’s 2,190,000. In the early going of Level 28, with the blinds at 50,000 and 100,000, the players started discussing a chop. Gary Burks interrupted the conversation by saying, "I'll tell you what, let's play this one--I haven't looked yet. Let's play this one, and then we'll talk about it." Preemo then looked at his hole cards, acting first from the button, and called the 100,000 big blind. Burks looked at his hole cards and announced he was all-in. Preemo was incredulous, stood up and said; "I can't fold this,"
Pej Preemo showed pocket sevens while Gary Burks tabled queen-jack of hearts. The crowd gathered around to watch as the board was dealt. It was bad for the pocket sevens right from the flop, as a jack hit the flop and river with no seven to be seen. "That's the one I won the ring with," said Burks, recalling his 2011 Bossier City WSOPC win in the $345 NLHE Turbo event. When asked what he plans to do next, the 42-year veteran of the oil industry said he’ll probably just put it in the bank and go back to business as usual. “Although, I might buy a new tractor for the farm or a new bow. Bow season is about to start,” he said. This tournament marked the conclusion of the RGPS in Bossier City. The next stop on the Old West RunGood Poker Series will be in Council Bluffs, Iowa, at the Horseshoe from October 9-14.